Well, here we are, at the Phage. Guys--I'm gonna be honest here--I'm not super into the Phage. I tend to have a propensity toward nightmares and highly advanced aliens running around transporting the lungs out of folks' bodies just really wigs me out. Still, I think this disease--this culture ravaged by this disease--is an excellent running story for Voyager. 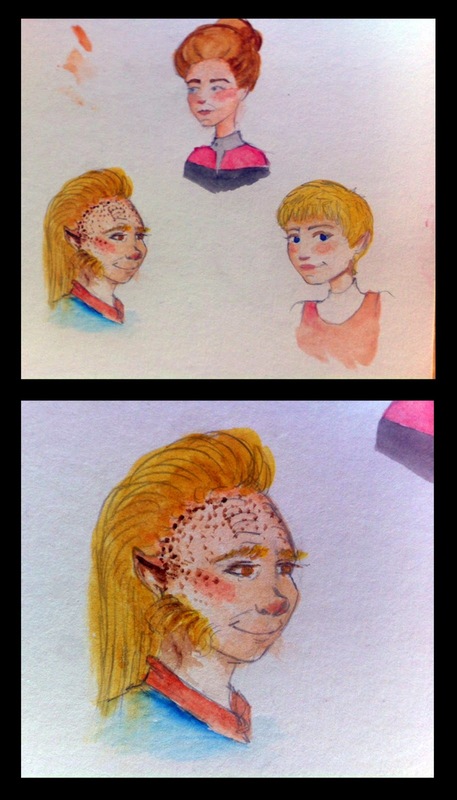 Here's the rundown: Neelix has been practicing his tricordering skillz so he convinces everyone to let him go on the away mission to hunt down some dilithium on a teensy planetoid. He's going around scanning things and suddenly his lungs are gone. They get him back to sickbay and the Doctor confirms it. Voyager tracks the warp signature of an alien vessel that had been in the area and finally finds the Vidiians who have super advanced medical technology but really questionable ethics when it comes to organ donation. Janeway wants the lungs back but they're already in some other guy so the Vidiians help The Doctor transplant one of Kes' lungs into Neelix. There's a lot to love about this one (if it doesn't give you the scream dreams) including some excellent Doctor scenes. I'm fairly sure this is his first use of "I'm a doctor not a ___" when he argues that he isn't a decorator. This jokey dialogue is right beside an excellent bit between The Doctor and Kes about The Doctor's feelings of inadequacy and his fear of failure. Additionally, he smacks Tom Paris right in the face. He's having a big day. This is a good one for Neelix too and (believe me I know I'm in the minority here) as much as I love the character that he grows to be, I cannot wait for him to get out of this jealous-of-my-girlfriend phase. So much of his good stuff in this one is overshadowed by the venom he has toward Paris regarding Kes. Kes who, by the way, ends up donating her lung to save him. 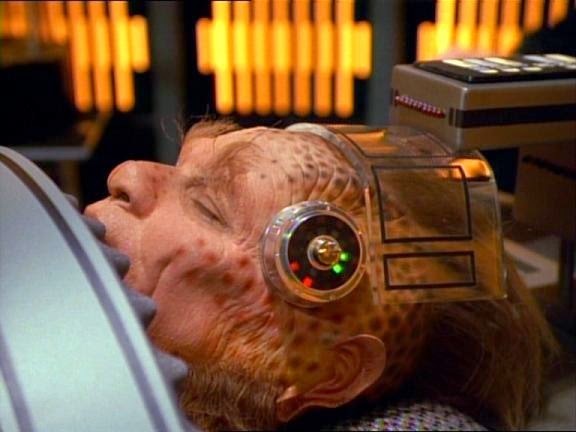 As I watched this one, I couldn't remember exactly how Neelix got out of his predicament but I was really hoping Tom would donate the lung instead. If I ever encounter your kind again, I will do whatever is necessary to protect my people from this harvesting of yours. Any aggressive actions against this ship and its crew will be met by the deadliest force. Is that clear?" The Vidiians' physical bodies aren't the only thing ravaged by the phage--their moral compass is also completely wonked up. They plainly state that they were once considered a society of intelligent explorers, artists, and thinkers. Now they do what they believe they must to survive and that means stealing from others what they cannot create and maintain themselves. Janeway's predicament is a classic Trek dilema but without any backup, in a tiny ship across the galaxy from anyone they know, her situation is unique. She feels sympathy for these people. She must do what she can to save her crewman but his lungs are already keeping another man alive. Her own ethics prevent her from simply taking back what she needs to save Neelix but she cannot let these people continue to harm her crew and she makes it clear that she'll protect them. It's a well-written, perfectly-acted scene and it sets a precedent for the ethical problems Janeway would continue to find herself in over the next seven years. Also, I recently had a short, graphic essay published and I feel like I ought to let you know about it just in case you're interested. It's over at Neutrons/Protons. This episode is an early glimpse of Voyager excellence.